Last December when I first moved into my current apartment near Zhongshan Park, I take one look out the 20th floor window at the old buildings across the river and thought, “those won’t last long.” It wasn’t just that they were old; they were clearly of low quality as well. What’s more, on every side were highrise apartment complexes. I felt pretty sure those structures were doomed. Here is another picture of the same area, taken last month. The demolition began in early May, I believe. If you look carefully you can see which buildings were taken out. The residential area at the left is still intact, but I’m certain it’s only a matter of time. It seems to be popular among some expat circles to mourn the loss of these “traditional” dwellings. Personally, I think that’s ridiculous. I’ve seen the buildings on the left close up, and they are constructed extremely shoddily. You hear about third world living conditions in Shanghai — well, this is one of those places. Those buildings–like most buildings in Shanghai–are not even very old. They were just built with inferior materials, so they seem like they have real history. If Shanghai wants to modernize, it really needs to tear down as many of this kind of building as possible and start building quality structures in their places. I’m not completely heartless, though. There’s a tragedy here, and it’s about the people. (Isn’t it always, in China?) The people that live in that area live in those wretched conditions because they’re poor. Knocking down their homes doesn’t help them at all; it just means they’ll be forced to relocate, while rich people move into the new highrise that’s built on the ruins of their old homes. Behind this kind of demolition and contruction movement, almost surely there are sad and evil stories happening. Officials sell the land to smart businessmen who are willing to provide the best bribe behind the scene and drive away the old residents with a small compensation or even violence sometime. Wealth is unevenly distributed and quickly flowing into the wallet of a few people during the process. You can buy and fix-up an urban hutong for a very reasonable price. Better value than buying an apartment, and the environment is usually much nicer and greener than in the legions of “Famous Paradise Mansions” springing up in their places. Also, there aren’t any elevators. So why doesn’t anyone do it? As long as the spectre of government sanctioned destruction is looming over the residents, there is no one with the power or incentive to renovate or modernize these buildings. So defenders of hutongs aren’t always stuck in clouds of foreign romanticism. And ragging on hutongs because they’re built with “inferior materials” is silly — not all hutongs are low-quality (“you can’t judge a book by its surrounding glass-spiked fence”), and its very dubious how many of their replacements are going to stand the test of time…. The real tragedy is that this is a circular institutional problem. So there isn’t any incentive to prevent a lot of these communities from going downhill once surrounding land values start to go up. Hmmm . . . I guess this is the “old reality” (6/25) to contrast against “China’s New Reality” (6/23). Do we actually know for sure that the “poor” people living in those homes are forced to relocate (Western news loves to work this angle) or are the people given the option to live in the new skyrise housing? Or at least, do we know if they are paid or rewarded any compensation by the state or city planning commission for their homes? Emminent domain is in the news over here in the states because many Americans feel the state has already too much power on claiming land as public use and thus forces you to relocate. Wilson. It’s one hundred percent true. If you live in China and have a chance to talk to the local people, they will tell you the same story. Yes, people would get some compensation for their relocation, but most of the time it’s a small carrot. If you refuse to move, sticks will follow. In China normally local governments have extreme power and they also like to stand on the same side as the land developers because of the bonus money from them. Because the government is so powerful, most people would avoid the conflict by accepting whatever deal provided to them. Sometimes conflicts do happen and you can image the final results. Last year in Nanjing, one house owner, who refused to accept the deal, was beaten and abducted in the night and the house was pulled down. This kind of story happens everywhere these days. Just a few weeks ago, a violent clash for the land dispute happened in Hebei province, leaving several dead and dozens wounded. In Tianjin, back in 1976, there was a huge earthquake…. most of the buildings that fell were from the 60’s and 70’s while the majority of hutong’s and Qing dynasty buildings, including multi-story ones, survived. This is simply Social Darwinism at work. And with the recent Eminent Domain decision of the USA Supreme Court, it’s at work there too. The decision says that if a higher economic use can be made of a piece of land, then the lesser user must make way for the more efficient or the more powerful. Thus the larger society advances no matter that individuals are destroyed. So it is in Shanghai, or Harare, or New London Conn. Welcome to this dog eat dog world. I know you know this, but just to clarify: these houses in Shanghai are definitely no hutongs. are these houses shikumen (is that the correct term?) or not that cool? If anyone has a chance, try to pick up The Power Broker, by Robert Caro. It’s a biography of Robert Moses, who was just about the most powerful figure behind the shaping and building of New York City (and also New York’s state park system and highways). He amassed so much power for himself–without ever being elected to any kind of position through the voting system–that he was able to completely destroy blocks and blocks of city landscape without ever really offering any kind of serious compensation to the families whose lives were destroyed. And everyone was literally powerless to stop him for about 40 years. So, not to defend urban developers in China, but the US has a track record with this stuff too. It would be interesting to see exactly how Chinese families are compensated. What’s the official story, but more importantly, what’s the truth? Actually, picking up that book will be difficult. It’s about 1,200 pages long. In Beijing they call them 胡同/hutongs, while in south the name 里弄/lilong is used. Actually they are different architecture styles. Kikko Man, the 1976 Tangshan earthquake destroyed the entire city of Tangshan (80% of its factories, 70% of its residential buildings). The whole area was not considered an earthquake zone, so no building was constructed with earthquakes in mind, but even considering that, I have some suspicion that the city was not a “brand new model city” recently cosntructed. Hence, the 80% probably consists of a wide range of dates. Another problem is that the soil is very unstable, and would require more technical measures than were previously employed, even in the Qing times. Ry, this is not Social Darwinism, this is State interventionism. There are many who wish to use the power of the State to “improve” the lives of the people, but most such “improvements” turn out to be poor investments. Concerning these houses, a lot of assumptions are being made, but no data coming forth to support such assumption. I know an American who has purchased such a house (not in that area, though). Housing is privately owned, therefor it is much more complicated, even in China, in determing compensations. Most poor people, when their homes are seized, receive a new home. The real problem is farmers. Farmers do not own the land upon which they farm. Therefor the local organization that has title to the land can sell it at whim, and the farmers (at least in this area) are given two homes, one in which they live and one in which they can rent out, as if anyone would want to rent a apartment when you are surrounded by out-of-work farmers). Most of the old buildings that I have seen being torned down needed to be torned down. We may wish to romanticize ancient Chinese technology (it was superior to the equivalent technolgoy in many parts of the world at any given time), it was still old technology. Actually, a close friend in Harbin and her family had to move because a new development was going in where her house was. The compensation certainly didn’t keep them from going deeply into debt to acquire new housing. Their situation is very sad. There is another interesting report today. The local government in Huai’an, Jiangsu Prov. is planning to build a new railway station 5 times bigger the old one. The reason is that the old one couldn’t embody the city development. The interesting part is that the old station turns out to be a new one, which itself is under construction and close to finish. The government hasn’t yet paid the compensations to the farmers whose farm lands were grabbed for the station construction about 8 years ago. Do any of the commenters here live in Shanghai? I’m all for preserving history, but most of you are way off the mark here. The buildings John’s talking about are not hutongs or shikumen. They’re not the “old Shanghai lanehouses” that realtors market to foreigners for quadruple their value. They are basically concrete barracks built by the government in the ’60s or ’70s, and any “character” they appear to have is a result of the combination of shoddy construction, pollution, and poor upkeep. A “Famous Paradise Mansion” would be a great improvement. As John mentions, it wouldn’t be so bad if these sort of settlements were replaced with quality structures (forgetting the whole displaced persons problem for a second). Sadly, based on what I’ve seen in many Chinese cities, quality is not a word I’d associate with even some of the newest, shiniest highrise developments. I fear we are looking at some serious slum highrise problems in the future. 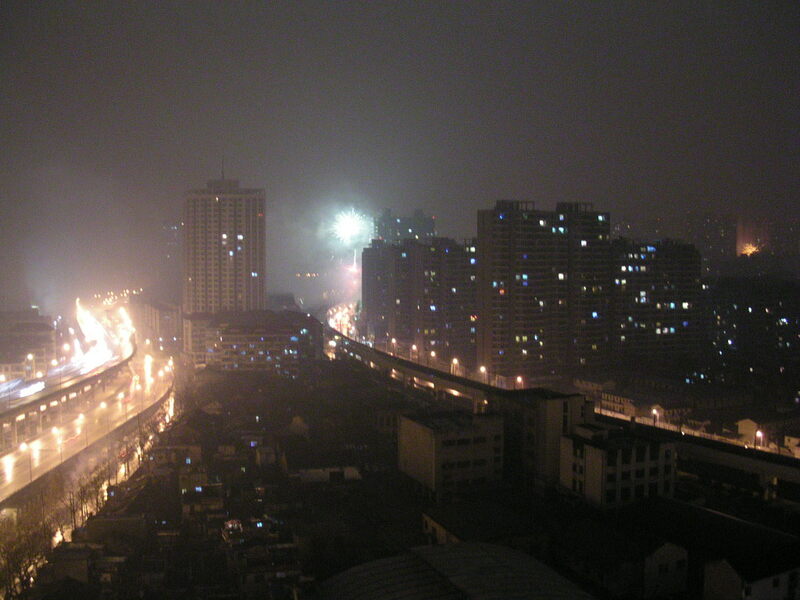 I lived in Tianjin for years. I know the earthquake was closer to Tangshan but referred only to the buildings in Tianjin. Tangshan is a relatively new city mostly built after “liberation”. Most of it’s buildings were built after 49 and were your classic communist appartment blocks. The population density in those shoddy 50’s and 60’s buildings coupled with the fact the earthquake happened early in the morning when everyone was in those buildings made the death toll so high. In Tianjin, the vast majority of deaths were in similar buildings. Most hutongs and qing architecture survived as did their inhabitants. My point about the old buildings is that just cause their old does not mean they are less safe or somehow worse. There are many nicely retrofitted hutongs in north China. In China, right now, new construction, outside of a few major “developed” construction companies in Beijing, Guangzhou, and Shanghai, is grossly unregulated, corrupt, and shoddy. Poor materials are used, uncertified and untrained architects do design work, and permits are “awarded” based on money, not meeting specifications and following regulations. Of course development is good, if done right, with the owner’s consent, and without harm to China’s cultural heritage. But much, if not the majority of China’s so-called development, is cheap, fast, and will not last. At least those old buildings can last a few decades or more. Why tear down “nice” old buildings? That I can agree with you, it is not the age of a building that matters, it is how well it is built, how pleasing it is, etc. that matters to the individual. That is why value is subjective. As I see the issue, though, it is a problem of whether the property is private or collective. Previously collectivized property that was privatized was done so at a cheap price. The consequence of that is the government can now relaim that property (emminent domain) at a cheap price. Privately developed property is now going at a very high price in much of China (a flat in Suzhou a few years ago would go for 200,000 or 300,000 RMB is now going for over a million; prices in Hangzhou, Nanjing, and Qingdao are even higher). These higher prices are quite restrictive. My view is that the farmers are hit the hardest. The farmers do not own the land they farm on, that is owned by the government or some agency of the government. Farmers are not compensated for the land, they do not own the land; they are compensated for the removal of their livlihood. I recall a story, from the late 50s or early 60s in California. The first school house was still standing, it was in an isolated part of this large ranch owned by an old pioneer stock woman, she may have been in her 60s or 70s. There was a group of people that wanted the State to recognize this first school house, wanted her to open her property up so people could go and see it in its original state and location. She did not like that at all, if they wanted it, they could buy it, take it off her property and do whatever they wanted. But they did not want that, they wanted the State to seize her property, not pay her at all. That old woman, just a day or two before the Assembly was to vote on the measure, got on her horse, rode out to the site, and burned the damn thing down to the ground. I do not favor the state seizing people’s property, whether it be China or the USA. If people want to preserve an old building, let them; if they want to tear it down and build a new, let them. 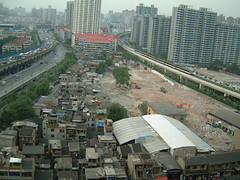 It is sad that so many of Shanghai’s urban poor are stuck living in crumbling shacks. Yet at the same time, it is wise to distinguish between the hovels you’ve photographed and the city’s old commercial housing. For one thing, shikumen and other types of alley houses are unique to Shanghai. While plenty of immigrants and fickle westerners think little of them, they are nevertheless a vital part of Shanghainese identity. Depending on which scholars you consult, between 70 and 80 percent of Shanghai natives grew up in such homes. In the 1850s, when British speculators sought profit from a massive influx of Small Swords Rebellion refugees into their concessions, the very concept of ‘spec built’ houses solely for profit, as opposed to personal use, was new to the Chinese. While the phenomenon of leasing property in China had become widespread as early as the eleventh century, it was nevertheless small-scale and stemmed from different motives, such as personal consumption or convenience. I might recommend the works of Hanchao Lu or anyone from the Tongji University historical preservation department for a closer look at the significance of these buildings. 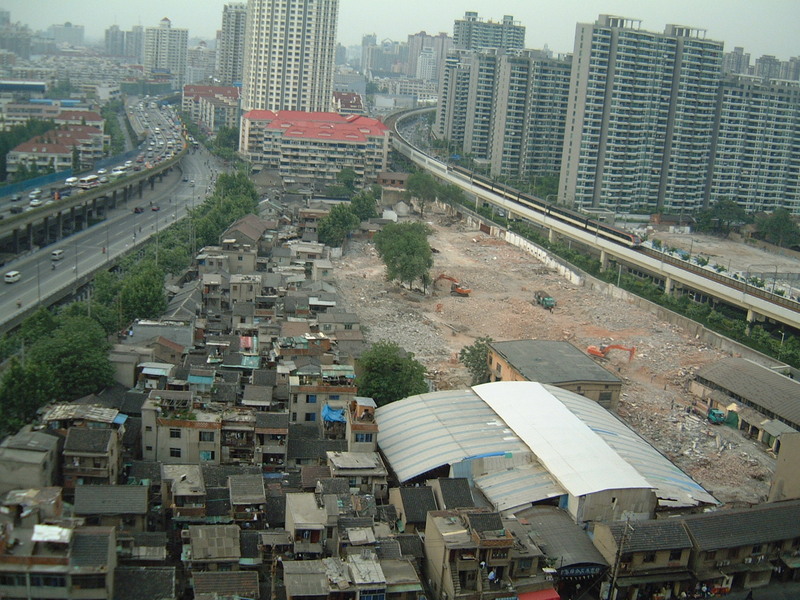 For Shanghai’s policy on urban displacement, check out “zuixin chengshi fangwu chaiqian zhinan,” published by zhongguo jianzhu gongye chubanshe, 2004. Shui On and preservation in the same sentence? Puh-leaze. I snicker when I see tour groups oggling the architecture in Xintiandi.